Due to our outstanding reputation and excellent customer service, Skyline Costa Luz has fast grown into one of the most recognised names in real estate on the Costa de la Luz. Whether it’s in the newspapers, on the internet, on the TV, we are being recognised worldwide and while this helps us promote all of our clients and their property interests, at the same time we are using this to help give recognition to other people who need it more than us. We are proud to support the Betel/Retro organisations (NGO’s) located in Chiclana de la Frontera, which are run by homeless people and ex addicts who sell second hand materials and furniture in order to help re-establish a new life for them. See our Eco friendly page for more details. Below you will find examples of people and organisations with which we have had the pleasure of working with over the years and in turn helping us to help others. 2014 Special Feature "Winter rental reductions by the beach. One of the most popular newspapers in Spain. Skyline was again contacted by the media giant to provide further information and background for their readers on how the winter season by the costa de la Luz can be a very affordable way to holiday in the sun without paying the high summer season prices, and yet still enjoy the warm climate, food and culture. The feature was published on 24 November 2014. 2012 Home and Abroad episode. One of the most popular TV programmes in the UK on overseas property. After researching through hundreds of agencies on the Costa de la Luz, Skyline was contacted by the program to represent them and their clients and find suitable properties to suit their client’s needs. Our properties were included in their “featured properties” section, which included “A luxury modern house” and “A very affordable house”. The programme was broadcast on 29th October 2012. 2009 Special Feature "Una casa en la playa". 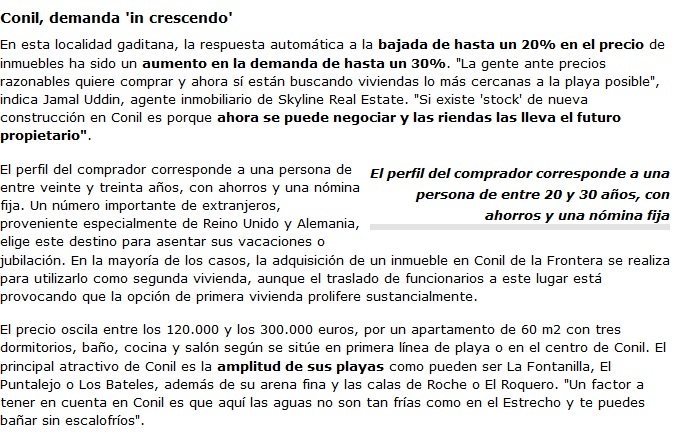 Skyline was contacted by the media giant to provide information and statistics for their readers on how the economic crisis has created opportunities to buy property by the coast at knocked down prices. The feature was published in August 2009 in the newspaper and online. 2006 Business feature. One of the biggest national newspapers in Spain. 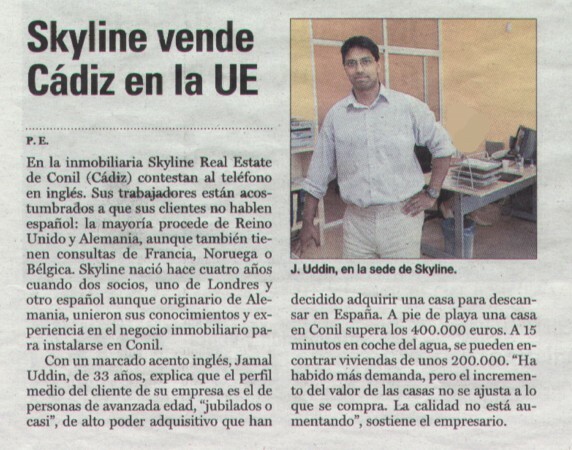 Just one year after opening our Conil offices, Skyline was contacted by El Pais to feature in their business edition. Due to his vast years of experience, Skyline director, Jamal Uddin, was telling the truth as he saw it. Concern over rising prices and the inverse lack of quality in the construction, a prelude to the worldwide financial and real estate crisis that occurred in 2007/2008.